From left to right: Y. Poitevin, F4E; K. Baker, F4E; H. Jahreiss, F4E; P-Y Chaffard, F4E; J. Schwemmer, F4E; G. Leidenfrost, F4E; L. Delong, ITER China; B. Zhang, MOST; M. Wang, ITER China; Q. Xiaoyong, MOST; C. Chunyu, MOST; and Y. Zhu, ITER China. 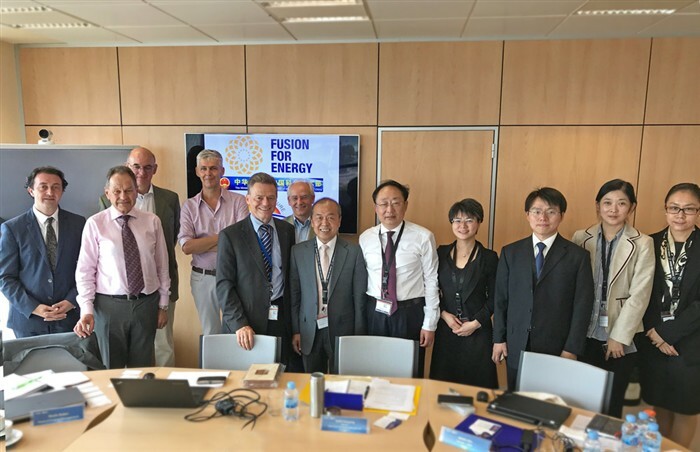 A joint delegation of key representatives from the Chinese Ministry of Science and Technology (MOST) and the Chinese ITER Domestic Agency (ITER China) has visited F4E in Barcelona and Garching. There were constructive meetings on topics of common interest and the mutual understanding of the European and Chinese fusion programmes was improved. The Chinese delegation also held meetings with EUROfusion, visited the Max-Planck Institute for Plasma Physics (IPP), met German governmental officials and toured the fusion experiments in Garching (ASDEX Upgrade) and Greifswald (Wendelstein 7-X). The Chinese delegation included ITER China’s Director General, Professor Luo Delong and the Deputy Director General for Policies, Regulations and Supervision in MOST, Mr Bingqing Zhang, as well as other senior managers from both organisations. They travelled first to F4E Barcelona to meet with F4E’s Director, Johannes Schwemmer and his management team. This visit was an opportunity to build on the visit of the F4E Director to China earlier this year, where the progress of ITER work was the main topic. Talks were held in Barcelona on topics of common interest such as fusion programme management and the Breeding (Test) Blanket Modules. The delegation also had the opportunity to meet with the Head of the European Commission Representation in Barcelona, Mr Ferran Tarradellas. Fruitful discussions were held at F4E concerning topics of common interest in ITER such as programme management. The Chinese delegation visiting the European Commission Representation in Barcelona. Left to right: Q. Xiaoyong, MOST; C. Chunyu, MOST; M. Wang, ITER China; L. Delong, ITER China; F. Tarradellas, European Commission; B. Zhang, MOST; and Y. Zhu, ITER China. On the second leg of their visit, the delegation visited F4E in Garching, Germany, where the status of the Broader Approach projects was presented. The programme manager of EUROfusion, Professor Tony Donné, joined the meetings to discuss European and Chinese activities in preparation for next generation fusion devices. While in Germany, the Chinese delegation was welcomed to the IPP by the Scientific Director of IPP, Prof. Dr. Sibylle Günter, and other senior managers and visited the ASDEX upgrade tokamak in Garching and the Wendelstein 7-X stellarator in Greifswald. Informal meetings with representatives of the German Ministry of Research also took place. “We were honoured to welcome this high-level delegation to Europe and look forward to intensifying collaboration with our Chinese partners in areas of common interest such as next-generation fusion devices and Breeding (Test) Blanket Modules”, said F4E’s Director Johannes Schwemmer. The Chinese ITER Domestic Agency delegation during their visit to F4E and EUROfusion in Garching. From left to right Q. Xiaoyong, MOST; M. Wang, ITER China; D. McDonald, EUROfusion; L. Delong, ITER China; P. Barabaschi, F4E; T. Donné, EUROfusion; J. Schwemmer, F4E; G. Federici EUROfusion/F4E; B. Zhang, MOST; C. Chunyu, MOST; and Y. Zhu, ITER China. The Chinese delegation visiting IPP Garching. From left to right: M. Wang, ITER China; S. Günter, Scientific Director of IPP; H. Zohm, IPP Board of Directors; J. Schwemmer, F4E; L. Delong, ITER China; B. Zhang, MOST; C. Chunyu, MOST; and Y. Zhu, ITER China.